Successfully Added Mini Magnetic Card Reader to your Shopping Cart. Fits in the palm of your hand, stores up to 2400 credit card or ID entries and has an internal battery for use while on-the-go. No computer or cables necessary. This ultra compact credit card and ID reader lets you quickly swipe and store credit card or ID information directly to the internal memory. It’s battery powered so you can take it anywhere you go and without worrying about connectivity or power-supply issues. Just turn it ON, swipe your card and that’s it! The internal battery recharges from any USB port and is good for 72 hours on standby, or up to 10 hours of constant use. When you get back to your home or office simply connect the credit card reader to any USB port on your PC and you'll have access to the list of credit card or ID information, sorted neatly by time and date. When it comes to portability, reliability, and ease of use, nothing can beat the G318 mini credit card scanner. It’s so small that it can be attached to your key-chain or comfortably slipped into your small pocket without noticing it’s even there. It’s the ideal choice for any movable data collection (trade shows, racing events, concerts), point of sales (credit card data collection), attendance logging (student ID, membership card), law enforcement (DMV card) and more. 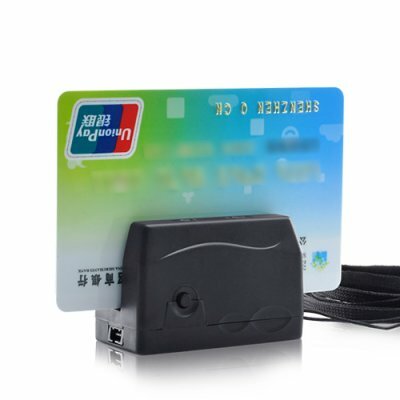 The G318 mini credit card scanner is not cheap. But when you factor in the advanced technology used to create the world’s smallest credit card scanner, the increased sales from being able to easily take orders everywhere you go, and the time saved from carrying around cumbersome card processing systems, then the G318 is relatively inexpensive. The G318 mini credit card logger is also backed with our one year warranty and is in stock now and ready for express delivery worldwide. Order now while supplies last. Please check with your local customs regarding the legality of importing this credit card reader. Chinavasion is not responsible for items that are stopped or confiscated at customs.